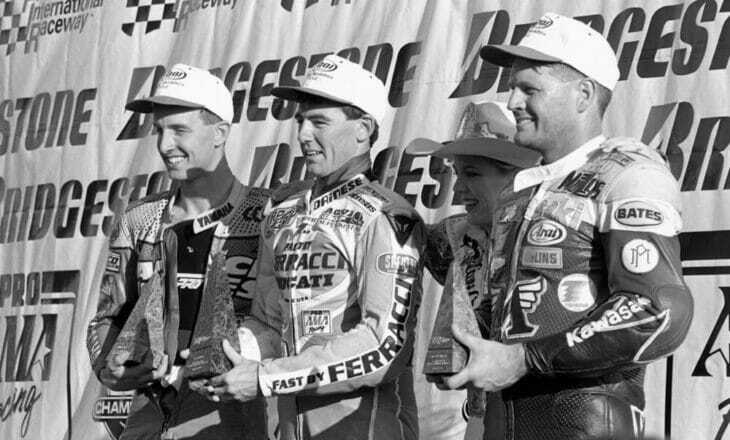 In this week’s Throwback we dial back the clock 25 years to podium of the Phoenix International Raceway round of the 1994 AMA Superbike Championship. No one knew it at the time, but the rostrum that day was filled with World Superbike Champions, past and future. Fast by Ferracci Ducati rider Troy Corser scored the victory that day in Arizona, ahead of runner up, factory Kawasaki’s Fred Merkel and Vance & Hines Yamaha’s Colin Edwards who took third. By 1994 Merkel was already a two-time World Superbike Champion. Corser and Edwards would also go on to become two-time champs of the series as well.